At any time of the year, when there are significant national celebrations or historical activities, we often hear the question: How much do we love the country? Seems easy enough to answer, but not quite. For that may characteristically invite a chaser of a thought: That what one declares as one’s sentiments may not necessarily be the only, or even the better, level of how a person may love one’s country. 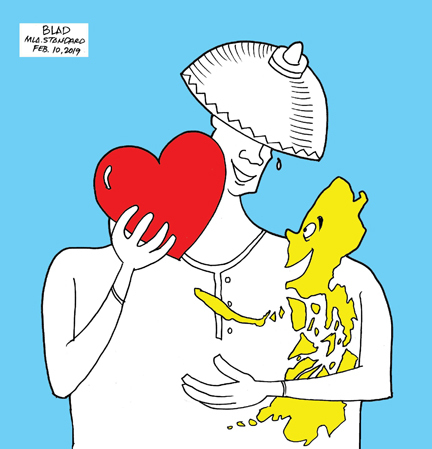 Of the 106 million thinking Filipinos, at least half the number can have in their systems different ways of loving the Philippines, their birth land or their ancestors’. This is where we jump-start the discussion and limit ourselves, from our window as impassioned observers, to just a couple: Taking pride in the country’s cherished history with heroes’ valor for unity and nation building and, the other, a sustained interest in studying and appreciating its cultural archive. This is where the ordinary farm hand, the modest fisherman, the theoreticians and scholars in the metropolis, among other units of society, share the same rung of patriotism, whatever their academic credentials and persuasions are. For love of country can be very personal to a certain point. Where and when we study the history of our country, taking pride in the bravery of our ancestors in building a nation for the younger generations at the expense of spilling blood in the process, where and when we take time to look for the gold in our country’s cultural chest, the things that make the Philippines unique because of its distinct rituals, material goods, the things the people use and produce, the beliefs and values of the people from Batanes to Tawi-Tawi as well as the ways they think about and understand the world and their own lives, we become silent patriots.